When creating an image for my ongoing Constructs series I work intuitively. My images are best described as photo assemblages, which are composed from three or more photographs. All images are digitally constructed in Photoshop and all photographs used are ones that I created. The following paragraphs describe the process of constructing the form and content of a particular image. 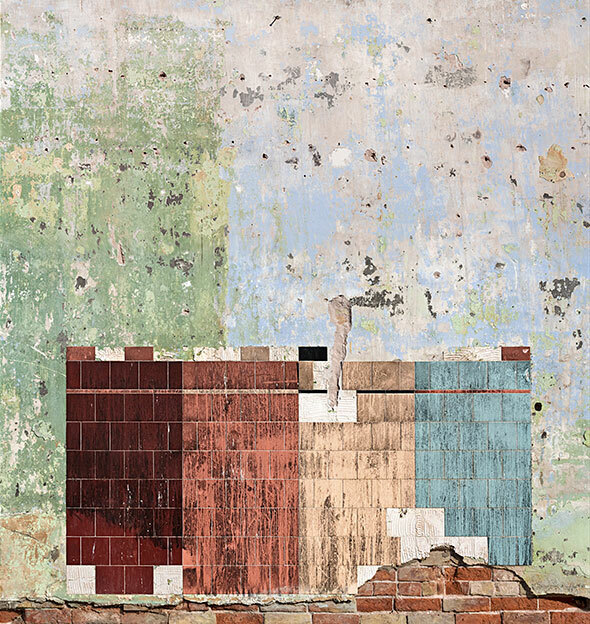 A photograph of the remains of an old building was the catalyst for the image titled “Ode to the 20th Century” (figure 1). I envisioned the tile panels as components of a fireplace mantel. With that reference point, I developed my concept. Initially I adorned the mantel top ledge with a vase of flowers. The addition of the vase caused the mantel to advance into the foreground, an effect I was after. It became clear that I now needed to add more details and contrasting colors within the mantel tiles to better clarify that the mantel was sitting in the foreground of my composition. I then inset the eroded and colorful figurative tile detail panel into the existing tile panels (figure 2). The new figurative tile panel represents a Native American Yei figure. Not only was I beginning to define more spatial clarity within my composition, but the content of my image began to emerge. The Navajo Yei Spirit is believed to control climatic elements. I contemplated the addition of a painting or mirror above the mantel as those are frequent residential design elements, but neither treatment would have worked within the context of my mantel. Instead of adding a framed painting I began to imagine a remnant of a painted ‘fresco like’ landscape as a more encompassing approach to the background of the image, and a landscape image related to the ‘Spirit’ of the already placed Yei mantel figure. 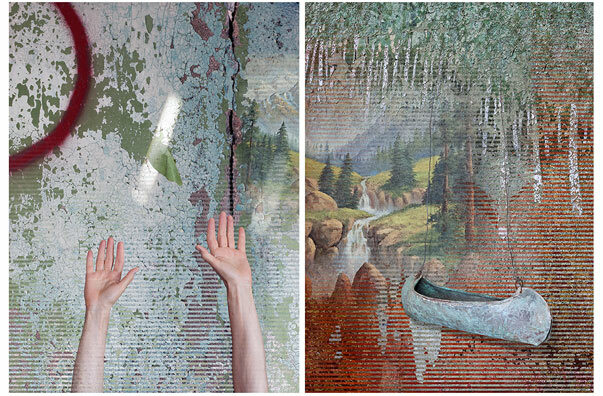 I created the simulated fresco by merging a photograph of a landscape painting and the textured plaster wall. I then added a linear pattern to the plaster wall area to enhance the separation between the foreground mantel and the background fresco. As I examined the work in process I discovered that the divets in the plaster began to suggest the presence of birds in the sky/mountain area. I then added images of birds in flight to the landscape painting. As a last addition, I added a photograph of a dove in flight to define the middle ground of the composition (figure 3). 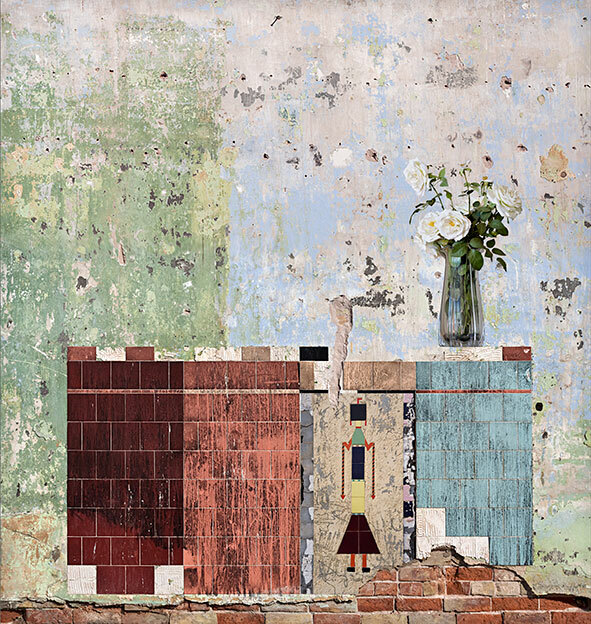 Judy Miller is a visual artist, living in Tucson, Arizona, who creates photo assemblages by melding architectural and environmental images with photographs of figures and other objects. She holds a M.F.A. in photography with a minor in drawing, a M.A. in printmaking and a B.A.E. in art education. 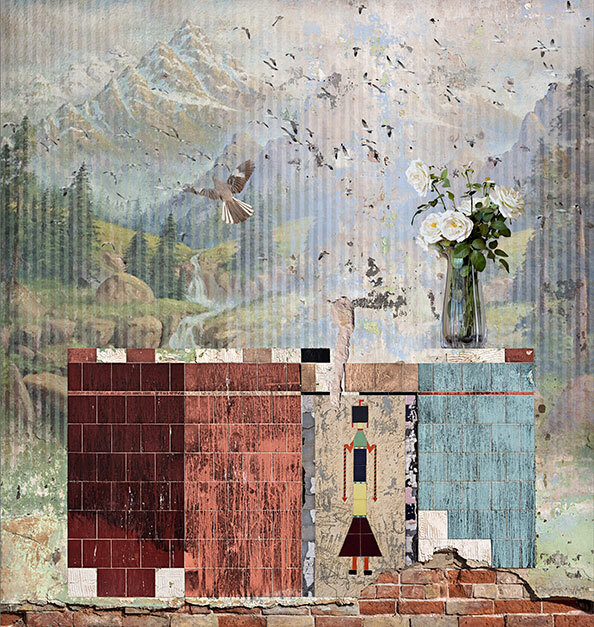 For numerous years prior to 2012, Miller was engaged with a series titled Imaginary Dioramas (you can view images from this portfolio on her website). The concept and form of images in the diorama series were carefully planned and sketched ahead of time and then the sketch was meticulously executed. Always two or more photographs were combined to create one of her dioramas. In contrast, the process of composing an image in her new body of work titled Constructs is more abstract and intuitive process. During 2012, Judy felt it was time to become more fluid in her process of creating an image and to allow herself to work more intuitively. Her new body of work mimics some earlier manual collage methods Judy used to construct images prior to digital photography and digitally composing her images on the computer. As a collector of photographic information, Judy is attracted to a wide range of subject matter including landscapes, abandoned architectural structures, textures, wax figures and statues. Judy is always on the prowl for photographic information, seldom realizing where or when a photograph might be used in one of her compositions, but always knowing the photograph is a subject of interest. Judy’s goal is to create a dynamic juxtaposition of elements that spark individual interpretation.